I just wanted to do something that’s 40 mins of 45 rpm selections…not heavy obscure stuff but more laid back mix that can be played at work around the house or driving… you know! Those of you familiar with DDay will know this means a serious headnodding trip and deep selection. You can download below – please note that for this occasion the download link is to a bandcamp page and so there is no stream from the site. iTunes/RSS subscribers will receive the show direct as always. Be sure to check DDay One’s website for more news on the man and his music as well as existing and forthcoming releases on his Content Label. This entry was posted on Monday, August 8th, 2011 at 1:35 pm. 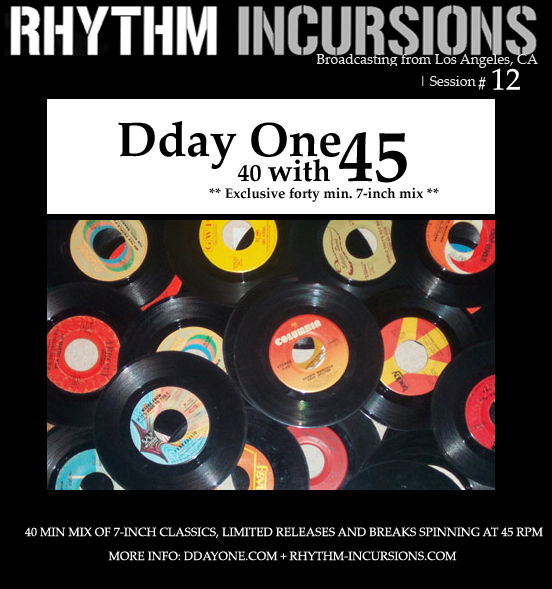 It is filed under Podcasts, DDay One - In Session series and tagged with Dday One. You can follow any responses to this entry through the RSS 2.0 feed.